While iPads are perfect for sketching down musical ideas on the move – or even building entire tracks – more and more iOS musicians are beginning to explore the potential of using their iPad for live music performance. Given the plethora of great instrument and effects apps available for iOS, their often minimal price tag, and the portability of the device, it seems like a no-brainer. Of course, ‘live performance’ covers a whole range of scenarios – from setting up an on the fly bedroom jam with various bits of hardware to gigging in front of paying punters. But whether you’re a keys player, a guitarist or a bassist there are plenty of ways to work an iPad into your rig. Okay, so this one is a given, if you’re wanting to incorporate an iPad into your gigging setup then having an iPad is going to be pretty essential! While a lot of the synth apps available for iOS feature their own built in touchscreen keyboards these are far from the most practical when it comes to actually trying to play music. 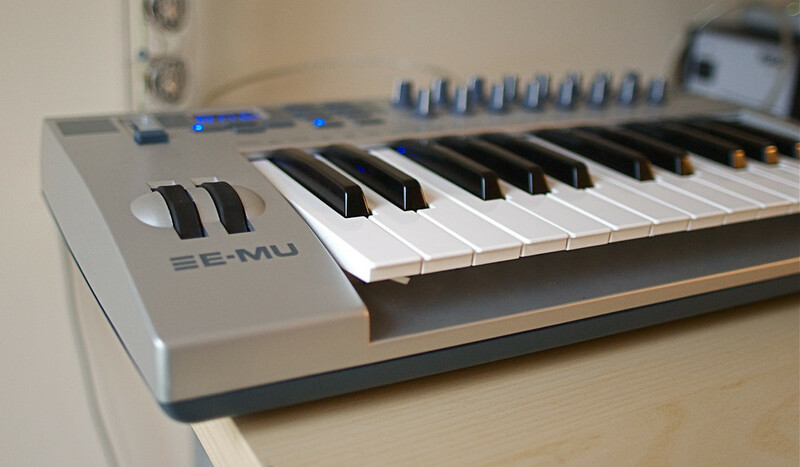 Getting a good MIDI keyboard will make everything considerably easier, especially one with extra midi controls like knobs or sliders as you can assign these to parameters on the iPad giving you an extra element of control over your sound when performing. 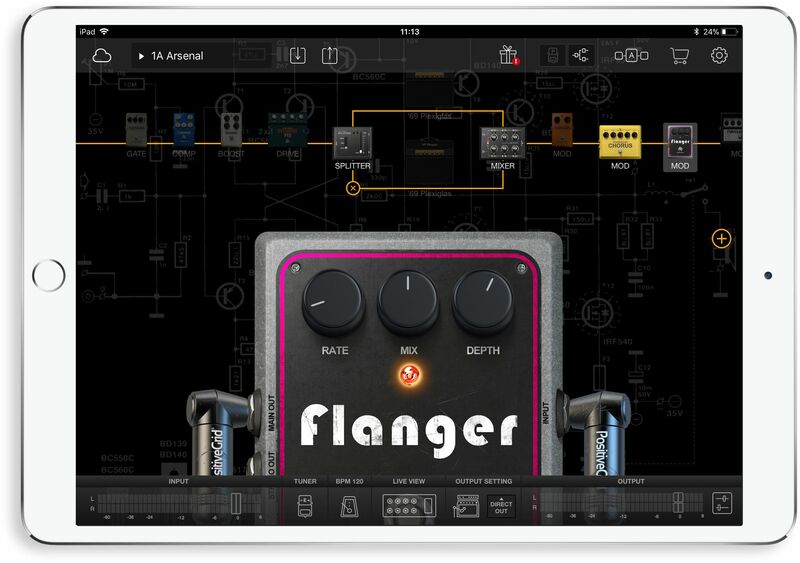 If you’re wanting to hook up some hardware or you’re a guitarist or bassist wanting to run through some iOS effects then you’ll need an audio interface to actually get the output from your instrument and into your iPad. There’s a whole range of different options out there depending on what you’re wanting to achieve, IK Multimedia’s iRig is great iOS specific interface for guitarists and bassists that simply plugs into the device’s headphone jack. However, any USB audio interface should work as long as you have the correct connection. So you’ve got all your kit set up, what now? Well you’re going to want to get some apps to use live and there’s a whole host of apps available for you. For keys players, having so many versatile apps at your fingertips can be a godsend with a whole load of great synth apps, such as Moog Model 15, Sunrizer and Magellan, just to name a few. In addition there’s a ton of great effect apps for adding an extra dimension to your sound. For guitarists, apps like IK Multimedia’s AmpliTube or Positive Grid’s BIAS apps can do a fantastic job of shrinking your rig by providing amp and effects modelling at a fraction of the price and size of the real world equivalent. When it comes to using an iPad for live music, no set up is truly complete without Kymatica’s AUM. If you aren’t familiar with AUM, it’s essentially a mixer app that functions in a very similar way to its real world equivalents. You’re able to set up multiple channels that can take the output from your instrument apps (both Inter-App Audio and AUv3) or your hardware via an audio interface. This makes it easy to keep control the levels of each instrument and also apply effects, beyond useful in a live situation. On top of this, AUM provides some opportunities for some really creative routing, such as setting up feedback loops, if you’re feeling more experimental. AUM is a great choice if you’re wanting to bring together hardware drum machines or synths and combine them with apps. A quick look on YouTube and you’ll see that this is a pretty common way of using AUM with people building up one-man band performances by using AUM. So while this list will give you everything you’ll need to perform live with your iPad, there are a few additional things to consider. You’ll need to think about how you’re going to power your iPad in a live situation, the last thing you want is to be about to launch into a solo only to have your iPad die on you. You might also want to consider where you’re actually going to put your iPad whilst you perform, so some kind of stand might be necessary, you can even get iPad holders which attach to mic stands as you’re likely to want your iPad nearby to quickly change settings. Also guitarists and bassists may want to consider investing in a stompbox like iRig STOMP to make it easy to switch effects when your hands are otherwise engaged. While an iPad for live music might open a whole new world of possibilities for you, there are some downsides to depending on your iOS device. For example, iPads can occasionally suffer from stuck MIDI notes or apps may crash, and while this shouldn’t happen often, it’s definitely less than ideal if it occurs midway through a performance.